Oh girl, you were so busted on the Reeses! Pierce has such a great sense of humor! "A turkey's wattle is mainly used as an ornament during courtship. The wattle is the flap of skin under the turkey's chin. It is common for it to turn vivid red when the turkey is under distress or during courtship." Pierce is going to go far he is funny and cares so much about his Mom. Pierce was taking care of mom, something tells me there are reeses cups in your future. The turkey wattle is defined as a cooling mechanism for the bird. It allows for the turkey to cool down since they don't have the sweat glands that humans have. It hasn't been proven, but it also may be used in a mating dance to attract female turkeys. I didn't know any of this til I googled and found this on ask.com. Interesting! a cow's tail :-), reese cups for Mom that is too cute and funny. Gobble Wobble I don't know...that lone gate is intriguing, is there anyone you could ask? So it was a cow's tail? Huh...I guess the lighting obscured the rest of the beast! And thank you for my soap. It got here yesterday. My youngest will love it--it's going in her Christmas stocking. 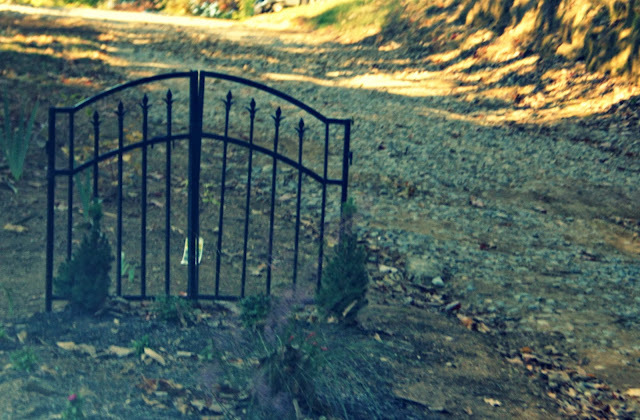 The little gate to nowhere is quite cute....and intriguing. I love Reese's too; your boy is a hoot! We lived in a 'hood that people came in buses to T or T. It was great; the more the merrier. Where we live now (for 15 years) We've NEVER had a trick or treater. Yikes. Our Royal palm turkey use to blush with his wattle , really lol if he was upset or excited. Yes though they are used i courtship. Laughed at the Reeces request. I have gotten slower at eating the candy, but almost had to go to treatment to get away.Wait, there are 2 bags in my frig. It's a lovely gate ! and would definately have caught my attention as well. Stopping in from Friday Fences...have a great week end. We have a street here in our town that is so popular for the kids.. The people actually dress up and give out their candy.. Such fun for all of us.. The gate that stands alone...We have a house near by that put up a fence like this ..I asked them one day when walking by if they were going to add to their fence and they said "No, it just shows where the corner of our property is after it was surveyed.. ".. The other corner has a tree..
love the gate that just sits there. poor thing. I laughed at the country folk coming down from the hills. That Pierce sure loves his mamma! Poor gate, sitting there looking abandoned. I wonder what the story is? Mmmm...Reece's Pieces...love those, too! Cute that Pierce wanted to make sure you got some candy you like. So sweet! I love little mysteries like that gate. How fun to imagine why it is there. How sweet of your son to think about his mom on Halloween! Well, it is a pretty gate...and it gae you a nice fence shot! Chuckling about the Reese's cups! That is just too cute...you raised him right! i'm am laughing that you got called out on the resees! that gate looks odd just sitting there, it's pretty though! we all go to a subdivision around the corner. it's big enough, sidewalks and the people are all really nice and it's expected that we all storm their neighborhood on halloween lol...one house even cooks hamburgers and hot dogs for EVERTONE! since it's in our school zone, the boys know almost everyone that lives there so it's really fun for them...there are a few lazy parents though that drive house to house and let their kid in and out of the car...i think that's ridiculous! Pierce sounds like such a cute kid! I hope you gave him an extra hug. I agree the gate-to-nowhere MUST be a garden ornament. Perhaps, it was a project that only got as far as putting in a gate and then they couldn't afford to do more so it sits there just being lonely. A cow tail! I was way off haha. It's funny about that gate to nowhere. Wonder why the heck it's still there? That's one seriously random gate. We bring candy to the house we trick or treat from--it's our donation to the townspeople as our kids go from door to door on Halloween! I bought 4 to put around my magnolia to prevent my deer friends from eating it! lol Glad to hear Pierce is looking out for you! That is the cutest that he wanted to get your candy for you on Halloween! Love that! Maybe someone is building a spirit gate. In some parts of Asia little gates that appear to lead no where are for letting good spirits into the home. I think the wattle is part of the mating display. I totally think you need to write a story about the gate. I love your fiction writing. What a pity we don't celebrate Halloween here..
Love the fence! Sounds like a fun time on Halloween and how sweet of Pierce to ask for PB cups. That gate is mysterious! But I just wonder, without other fencing, how can it stand firmly?? The gate to nowhere got me thinking about the train to Morrow. Glad you had fun with all those conversations. Its the same way here for Halloween. We live in a rural area in a small village the neighboring towns bring all their kids to our area because of safety reason I believe. Hope you have a great week. We had all sorts of kids and families that didn't live in our neighborhood on Halloween too. I don't care. I mean, if you don't have a "neighborhood" to trick or treat in, you are welcome here. I draw the line at the adults asking for candy though--I didn't like that part. Next year, I'm instituting a NO ADULTS rule. That was crazy. We have a little gate like that! It came with the house and it was in a garden so we left it there. My boys are wearing turkey shirts I made them last year as well. I like that gate - an entry to nowhere. Or everywhere. It looks like it still has a tag on it?